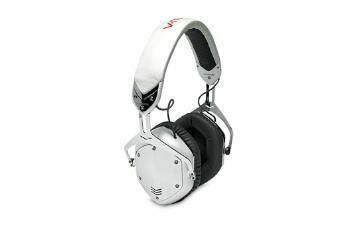 V-moda Crossfade LP review | What Hi-Fi? We wouldn't blame any hi-fi fashionistas for making a beeline for these V-Modas. They look pretty impressive and, dare we say it, stylish. Storm Troopers will go crazy for the White Pearl finish, while Darth Vader types can opt for Phantom Chrome or Gunmetal Black. The steel frame on which they're built has both form and function – bringing extra rigidity – while the foam earpads are especially comfortable. Box-fresh, the Crossfade LPs sound highly-strung and tightly wound, but once they're fully bedded in, sound quality goes to the other extreme. Bass sounds loose and woolly, smothering the other frequencies. Spin Eminem's Not Afraid and there's little room for vocals to breathe. Everything sounds subdued and lacking detail. Full marks for styling, V-Moda, but the Crossfade LP's sound quality is a real let-down.